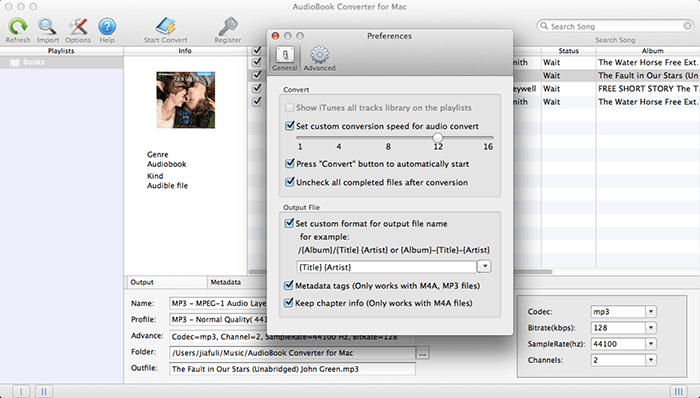 iTunes M4B, Audible AA, AAX to MP3 conversion has never been easier! 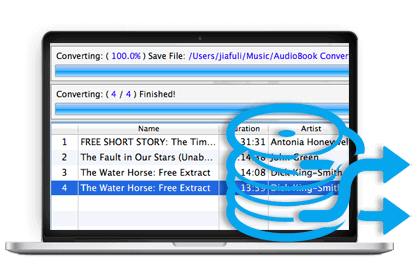 The easiest way to remove DRM from any purchased Audible and iTunes Audiobooks, and convert Audiobooks to MP3 or other audio formats. 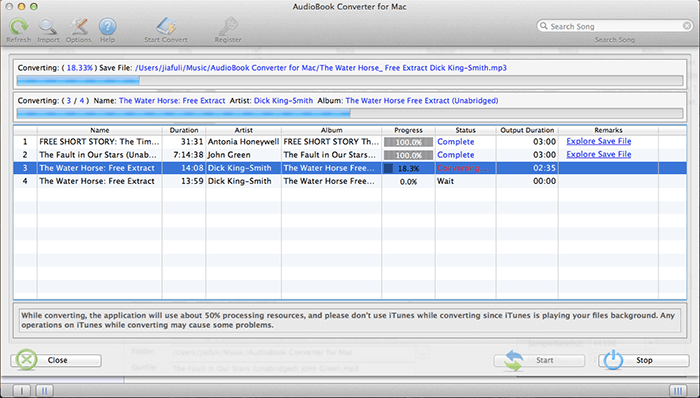 It compatible with any format of the audiobooks, including DRM protected (eg like M4B, AA, AAX, etc.) and unprotected (like M4A, MP3, etc.) formats. The program seamlessly integrates with iTunes. During Audiobook conversion, the software legally removes the DRM protection from the encrypted audiobooks with CD quality. Perfectly supports macOS 10.14 Mojave and iTunes 12.9.3.4. By using this excellent audiobook DRM removal software, you can easily remove the annoying DRM protection from iTunes and Audible audiobooks through a legitimate way & convert protected audiobooks to unprotected MP3, AAC, M4A, FLAC, AIFF, AU, M4R, MKA or AC3 files. With that, you can freely enjoy your purchased audiobooks from Audible and iTunes store on any device without restrictions. 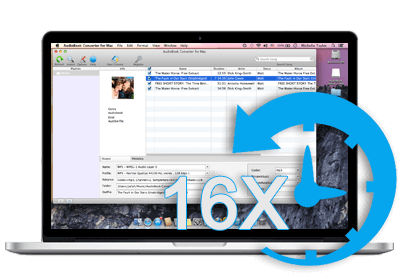 Work at 16X faster speed to remove DRM protection from Audible audiobooks with ease. You can simply select 1x to 16x conversion speed without compromising on the sound quality. You can hence quickly convert DRM protected Audible audiobooks within a short period of time. far more faster than any other similar Audiobook to MP3 Converter in the market today. and output MP3 is the same as the original sound quality. Moreover, the ID tags and chapter information will be kept in output MP3 or M4A. Remove DRM protection from various kinds of audibooks including the iTunes M4B audiobooks, as well as Audible AAX, AA audiobooks purchased from Audible store. 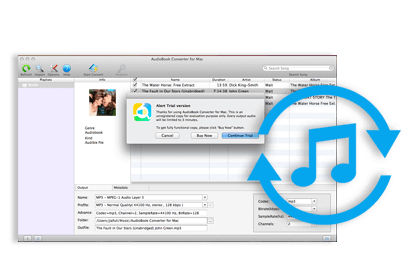 Batch convert iTunes M4B/M4A audiobooks and Audible AA/AAX audiobooks to MP3, and more other audio formats. Using multi-threading technology, you can convert multiple audiobooks in iTunes at same time simply with one click. This is ideal if you have a large audiobook collection to convert. Keep 100% lossless quality for Audible AAX, AA and iTunes M4B audiobooks. With the removal of DRM protection limits and converting the audiobook to an unprotected MP3 format, you can enjoy your audiobooks on any device such as Android, iPhone, Smartphone, Tablet, iPad, MP3 Player, Car radios, and etc, even for further editing purposes. You will never need to worry about any file format limitations. Enjoy your audiobooks anytime and anywhere! In addition to converting to the most popular MP3 format, you can also select output formats such as AAC, M4A, M4R, AC3, AIFF, AU, FLAC, MKA and etc according to your needs. metadata and ID tags will be saved to output MP3 and M4A files. The software will also keep the chapter information for audiobooks if you choose the output format as M4A. 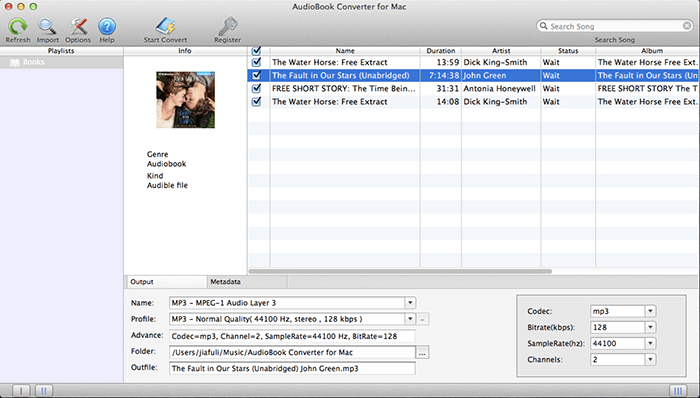 Moreover, Audiobook to MP3 Converter for Mac allows user to customize the output file name. 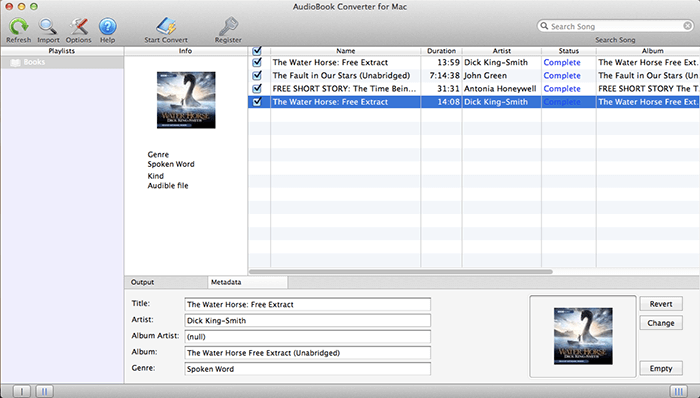 If you regularly purchase and download audiobooks from iTunes or Audible, AudioBook Converter for Mac is undoubtedly your best assistant. Download and start converting your audiobooks today! Supports Mac OS X 10.6 and later, including macOS 10.13 High Sierra and 10.14.4 Mojave. Support 7 languages: English, Deutsch, Japanese, French, Spanish, Simplified Chinese and Traditional Chinese.